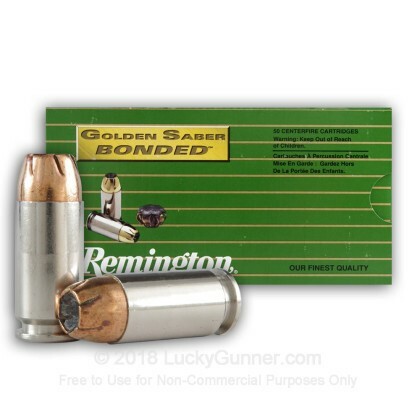 At the heart of this Remington Golden Saber Bonded cartridge is a high-performance hollow point bullet with a jacket made entirely of cartridge brass. The thicker and stiffer bullet jackets release energy over a longer distance and the innovative hollow point design promotes controlled expansion to well over 1.5 times the bullet's original diameter. This product is designed for Law Enforcement and occasionally made available to the general public through police trade-ins. 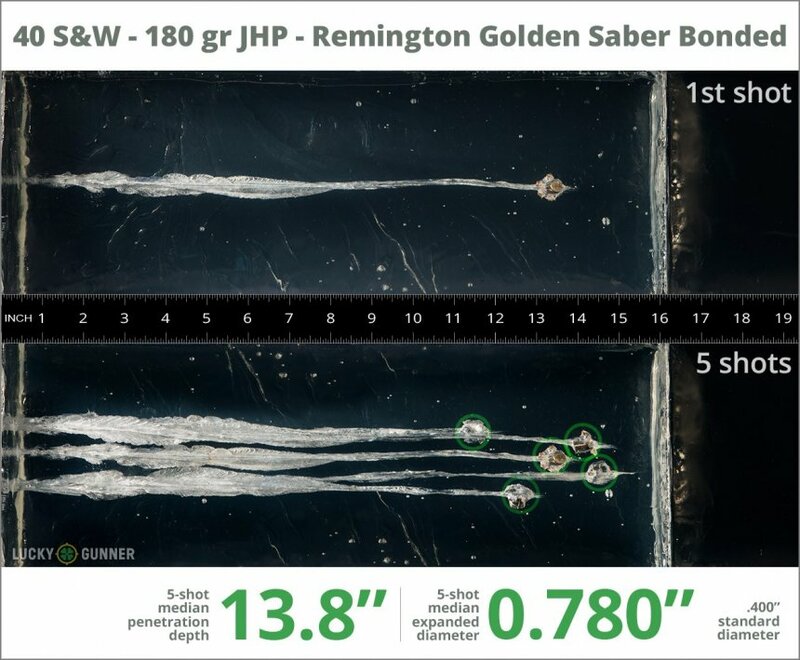 The Golden Saber bullets deliver virtually 100% weight retention and maximum penetration, making it ideal for barrier penetration and self defense situations. After firing five rounds of Remington 180 gr Golden Saber Bonded from a Glock 27 into synthetic ballistic gelatin from 10 feet away through four layers of fabric to simulate clothing, we then measured the expansion and penetration of the bullets for this .40 S&W (Smith & Wesson) load, which you can see in the chart below. Finally, if you'd like to see how this Remington load compares to other .40 S&W (Smith & Wesson) loads, check out the diagrams at the bottom of the page. Want to know more about our ballistic gelatin testing and self-defense ammo? Check out Lucky Gunner Labs for more information. 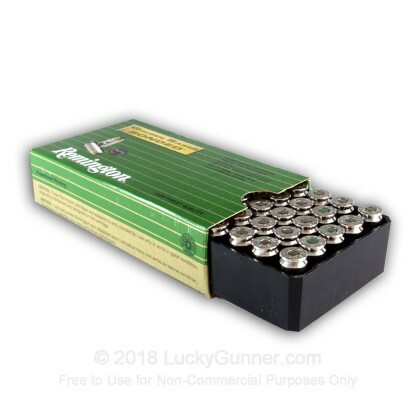 0.89" This ammo: 0.78" Min: 0.39" Median: 0.65" Max: 0.89"
13.8" 0" 9.8" 16.5" 32" This ammo: 13.8" Min: 9.8" Median: 16.5" Max: 32"
I'm buying the .40 S&W 180 grain Bonded Golden Saber JHP as the LE Black Belt version for $27 / 50 round box, or $0.56 / round. What a great value in carry ammo! Feeds & functions perfectly in my Astra A-100. 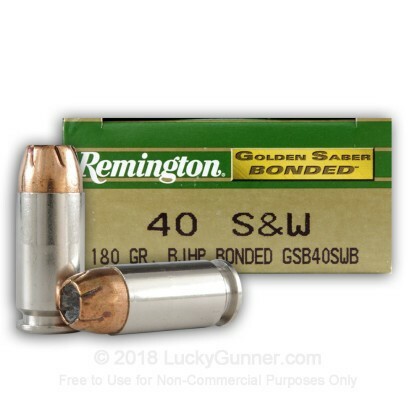 My alternate carry ammo is .40 S&W Cor-Bon 140 grain DPX at $1.35 / round and the Cor-Bon DPX doesn't have the nickel plated sealed cartridge cases the Remington Black Belt ammo has! 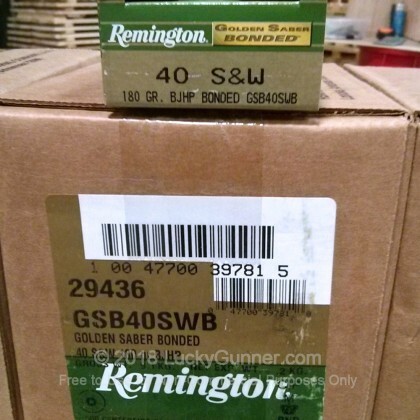 Superior Ammo, great price, and on time delivery, keep the good work up LG.